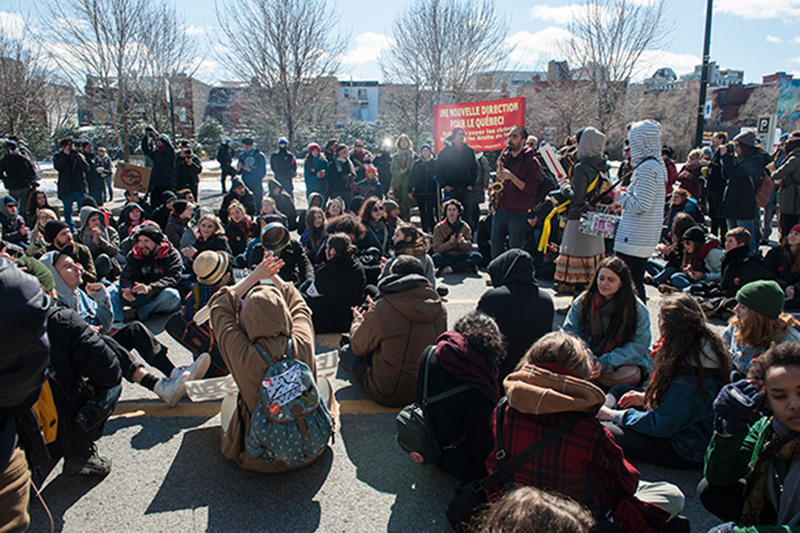 In stark contrast to the violence seen on Thursday (April 2nd), music, dancing, and a sit-down were the predominant themes at Saturday’s protests against oil. The protests went along peacefully, despite being declared illegal for not having declared an itinerary. The protest started half an hour later than anticipated and were around 500-strong walking up and down the streets around Place Emilie-Gamelin. Seeing as there was no itinerary given, the police did have riot police out and about and the first encounter with them could have easily led to a scuffle. The crowd and the police met quite literally face-to-face when the SPVM tried to stop the protesters from walking on Berri and Maisonneuve Streets. The police chose to let the protesters keep going and stepped aside, but kept a watchful eye at the sides. All went along peacefully until the protest arrived in front of Central Station on Berri Street. The entire crowd broke down then, stopping in the middle of the road and sitting down. While most protesters sat, some stood around the rest. All listened while a makeshift band of four musicians played music. Quickly after, the group got up and danced for well over 15 minutes. The wild party had conga lines, jumping and even inviting officers to come dance with them. The SPVM declined with silence. The SPVM did, however, give three warnings for protesters to move to Place Emilie-Gamelin. The protesters kept dancing and jumping to the music and even had a speech from Daniel Roy, one of the most active protesters. For those who do not know who he is, look for a man with a white t-shirt, a white sign and a Quebec flag and you will know who this man is. Slowly the group started dispersing. In the end, the SPVM intervened and circled the remainder of the protesters, and walked them down the street to Berri-UQAM metro station, where the protest kept going briefly. Ultimately, only two tickets were given out and the protest ended peacefully.